Saudi Arabia, October 31, 2018: The National Campaign Events for Early Detection of Breast Cancer (2018), which was held by the General Directorate of Health Affairs in Asir Region was fulfilled. It was organized by the Department of Communication, Relations and Awareness of the Directorate under the guidance of the General Manager of Health Affairs in the Region (Khalid Ayedh Asiri) and sponsored by AL-Jazeera paints company at AL-Rashed Mall in Abha city. The campaign was a great success and attracted many attendees and participants. The most important of these was Dr. Meshabab Bin Saeed Al- Asmari, Assistant General Manager of Health Affairs for Human Resources in Asir Region who inaugurated the campaign on behalf of the General Manager of Health Affairs in the region, a number of Asir health region officials and employees, a number of Al-Jazeera Paints officials and employees and the representatives of hospital directors, in support of the national campaign for early detection of breast cancer adopted by the Ministry of Health. According to the statistics confirmed by the manager of communication, relations and awareness of ' Asir Health', Abdul Aziz bin Yahya Al -Shaya, the number of female visitors to the campaign was estimated to be about 2520, about 483 female visitors have been converted to hospitals to conduct more accurate tests and more precautionary rays, praising the awareness that has become prevalent in the community, the reason that urged many women to come to conduct this test and to fight diseases early, God willing. Mr. Abdullah Bin Saud Al -Romaih, CEO of Al -Jazeera Paints Company, said that the participation of Al -Jazeera Paints in this campaign represents the social support first, the desire to contribute to the work of goodness and to promote health situation in the society secondly, asking the Almighty Allah to calculate this in their good deeds scales and to perpetuate health for all. The campaign continued in its bestowal for the people of Asir region. 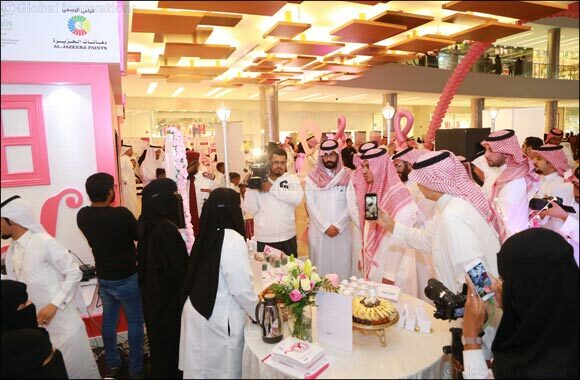 It was held at Al- Basateen Mall complex in Mahayel Asir Governorate for five consecutive days, received more women and did early tests for them.